With easy to follow video, text and big screenshots to teach you everything you need to know to burn the Ubuntu 8.10 install ISO CD image to CD, start your computer or laptop from the Ubuntu 8.10 install CD, install and update Ubuntu 8.10 LTS on your home computer or laptop from the Ubuntu install CD and Ubuntu 8.10 Desktop. Why you should pick Ubuntu 8.10 Linux vs other Operating Systems? Ubuntu 8.10 Linux is a fast, easy to use, reliable operating system which comes with a lot of pre-installed software, so you don't have to buy or download a lot of software like office suites, multimedia players, and other programs. The main advantage is Ubuntu 8.10 is it is free to download, and use. There are no hidden subscription and licensing fees. You also don't need to install an Windows based Antivirus like AVG or Firewall software like ZoneAlarm like Windows based computer since Windows Viruses, Worms and Spyware can not run in Ubuntu Linux.Although, you can use ClamAV Linux Antivirus, and Enable Ubuntu's built-in firewall for Ubuntu if you feel more comfortable with a security suite in Ubuntu. ClamAV is also free like Ubuntu. Ubuntu also has a large user base, so it is very easy to find help with Ubuntu related problems you are having by just searching Ubuntu.com website, Ubuntu help forums and blogs, and if you live in a medium to big sized city or town there might even be a Ubuntu usergroup/club like FreeGeek you can join to learn more about Ubuntu Linux. First you'll need to burn the CD. Here is a screencast I did for burning Ubuntu 10.04 to a CD with CDBurnerXP which is exactly the same as burning Ubuntu 8.10 LTS to a CD-R burnable disc.If you do not have a CD Burner, you can buy a copy of the Ubuntu install CD at Ubuntu.com . Download the Ubuntu 8.10 LTS CD ISO for burning the Ubuntu install CD from : old-releases.ubuntu.com/releases/intrepid. In most cases, download "ubuntu-8.10-desktop-i386.iso" file unless your computer or laptop is using an AMD64bit CPU if your computer or laptop is using an AMD64bit CPU then download "ubuntu-8.10-desktop-amd64.iso" file from the site. You also have the option of downloading the files with bittorrent which could be faster then direct download if there are a lot of peers online sharing the Ubuntu 8.10 install ISO. However, you need to download the .torrent versions of the Ubuntu install ISO Live CD file and use a program like Utorrent to download the Ubuntu 8.10 ISO via Bittorrent. You can download Utorrent at Utorrent.com. Download CDBurnerXP installer file for Free at cdburnerxp.se. Once you have CDBurnerXP installed on your computer, you just follow the wizard in CDburnerXP by telling CDburnerXP where your ISO file for Ubuntu 8.10 is located, and clicking the Burn button on CDBurnerXP to begin the CD burning tasks on a blank 700MB CD-R or (DVD-R disk if the computer you are installing Ubuntu has an DVD-ROM drive) you inserted into your CD Burner/writer drive on your computer. Do not use a 650MB or smaller sized CD-R disc since the Ubuntu ISO is almost 700MBs. If you do not have a CD-ROM drive on your computer or laptop, you can buy a USB external CD-ROM drive to boot from your computer's USB external CD-ROM drive, but make sure your computer can boot from an external CD-ROM drive before you buy one. The information on if your computer can boot from an external USB CD-ROM drive is available in your computer manual, motherboard manual, or in your BIOS or CMOS for your computer. It is also possible to make a bootable USB flash drive to boot Ubuntu on to, but not all computer and laptops can boot from a USB flash drive, so you need to refer to your computer manuals or your computers BIOS or CMOS settings. You can read my tutorial on how to make a Bootable USB Flash Drive with VirtualBox. If you do not know how to start a computer from a USB Flash Drive, you can read my tutorial on Starting A Computer From a USB Flash Drive. It is also possible to install Ubuntu 8.10 via your home or work network, but it is a very advance topic which I won't cover. But, there are many tutorials which teach you how to install Ubuntu via your local area network. If you need help learning how to start your computer from a CD drive, you can watch my video of me starting my HP a1720n desktop computer with the Ubuntu 10.04 install CD which is the same steps you need to do to start your PC with Ubuntu 8.10 CD. If you own a Dell, Compaq, E-machine or other brand of computer or laptop, it shouldn't be too different starting your computer from a CD instead of your hard drive you installed Windows to. 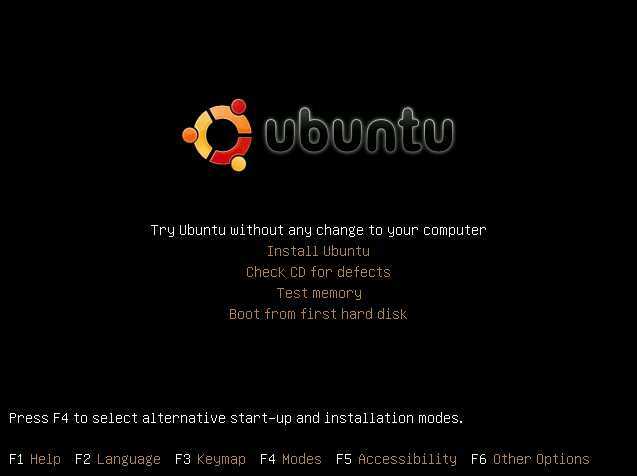 All you have to do is setup your BIOS or CMOS to look for a bootable Live CD like the Ubuntu Install CD before it looks for a floppy, or hard drive. Some computers made in the last 4 years have a boot loader program built-into the computer which you can use to manually pick what drive to start your computer from first. The Bootloader short cut key is ESC for HP computers and laptops which I used and own. It is best to refer to your computer or motherboard manual to see how to make your computer start from an Installation CD. If you installed Windows in the past, booting to the Ubuntu Install CD is exactly the same as booting from the windows install CD. Tutorial for how to install Ubuntu 8.10 Desktop Edition on your computer and laptop by yourself. A step by step picture and text based tutorial which shows you all the steps you need to take to install Ubuntu 8.10 on your computer or laptop. 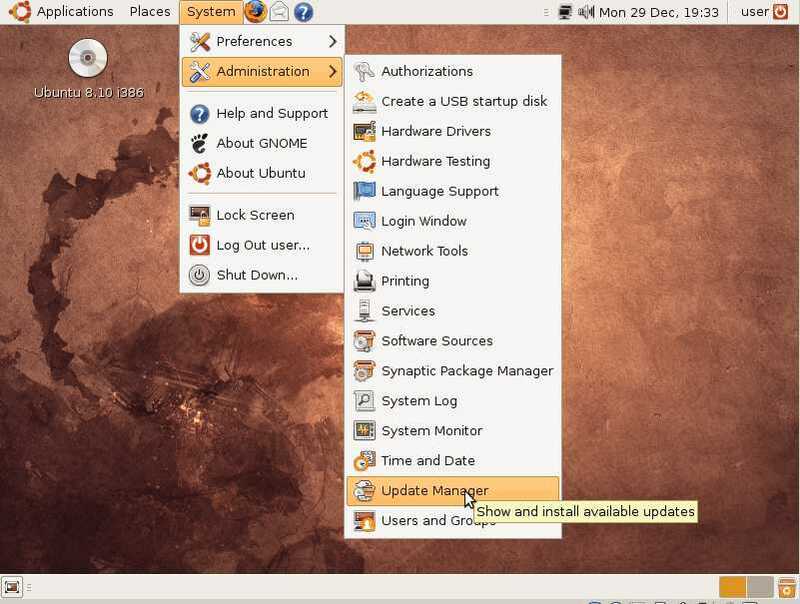 Tutorial for teaching you how to update Ubuntu 8.10 Operating System and software. A step by step picture and text based tutorial which shows you all the steps you need to take to update Ubuntu 8.10's Operating system and its installed software on your computer or laptop.